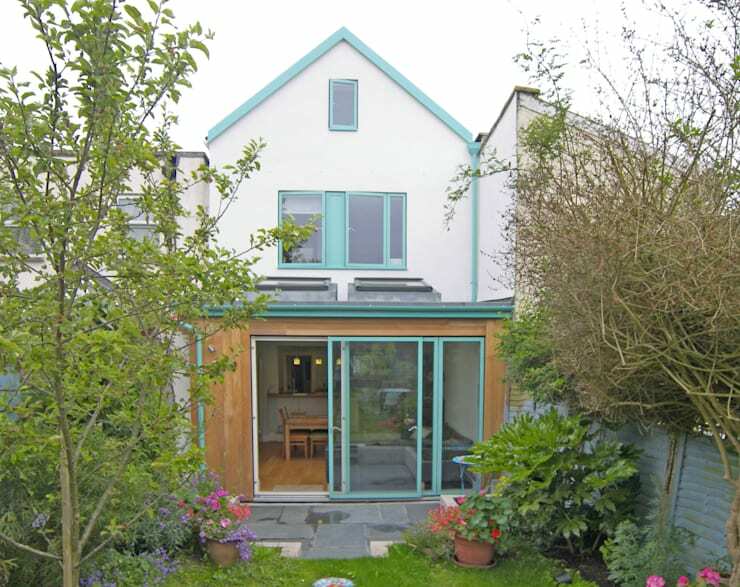 It's not just the extension itself that serves to impress here. There is a commitment to a vibrant colour scheme that we haven't seen before but can't deny is fantastic. Reminiscent of 'Tiffany Blue', the turquoise that permeates almost every surface helps to bring this house together as a whole; both the original sections and the new additions. 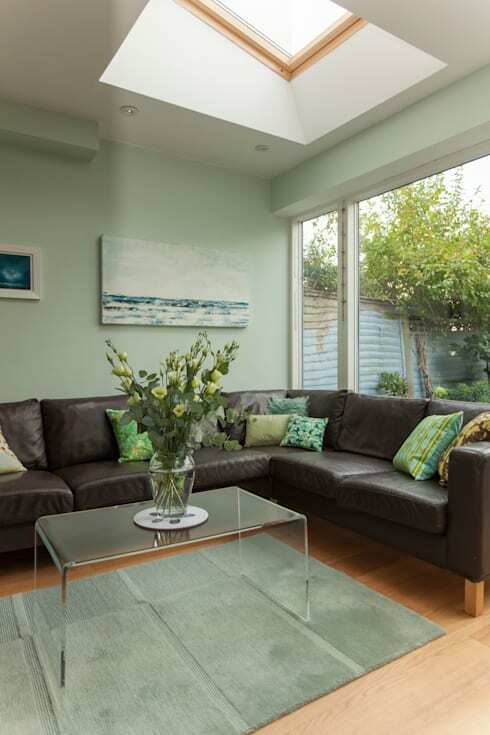 That 'funky' colour scheme looks set to be a real focal point here so let's take a proper look at it! When you read about a house that has a lot of turquoise on it you probably prepared yourself to not like the finished product much but you can't deny that this looks lovely, can you? With flashes of vibrant colour being used on small elements, the overall impact is huge. We think the guttering looks amazing, not to mention the window and door frames but, offset against the cream colour of the house and the natural wooden frontage of the lower extension, it really doesn't look too much. That's quite a feat. Well here is the proof that turquoise is very much the favourite colour here. While this might not be the shade that everyone would choose, we are shocked by how subtle and beautiful it looks. A large expanse of space to be painted, it's staggering that this open plan zone doesn't feel too constricted by colour. With subtle white accents breaking up the solid block of turquoise everywhere, the space feels light, airy and most importantly, individual. It's the extra details we love though, such as those blown glass pendant light shades. Gorgeous! 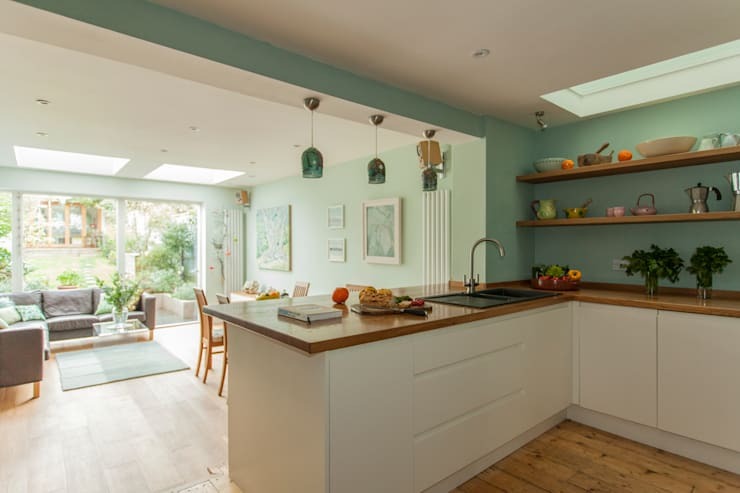 Don't you think that this turquoise really lifts even the most perfunctory of spaces to feel a bit more exciting and almost tropical? There is something almost beach hut about the vibe and we feel like we are on holiday just looking at it. 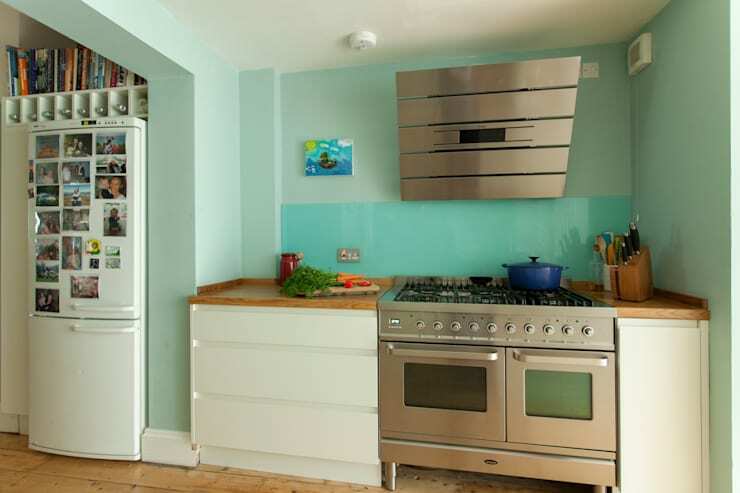 The installation of brushed metal appliances has helped to further break up the expanse of colour and we are in love with that funky extractor. In fact, funky is the word of the day for this home as what else can effectively describe the feeling of fun and style that it evokes at every turn? In case you hadn't already picked up on certain clues and hints we should tell you that this is the home of an artist and now you know, you can really tell, can't you? The unabashed use of colour, the brave choices and the addition of stunning paintings really tells you a lot about the owner. 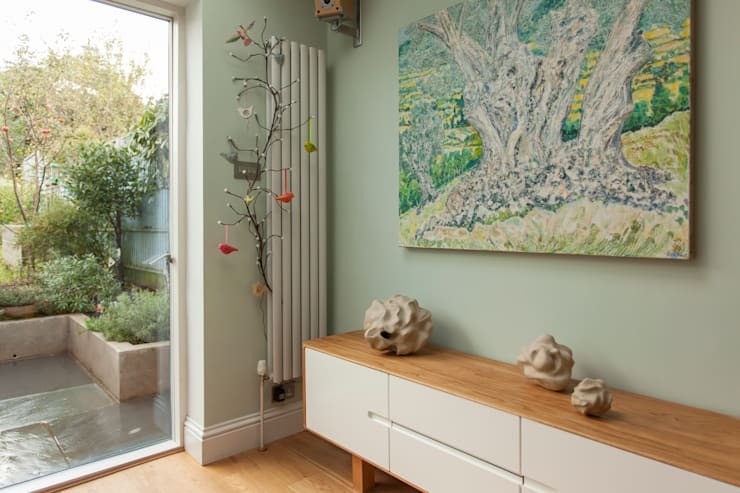 We love that even necessary and traditionally quite boring items, such as radiators, have been given the artistic treatment in this home and think that this super sleek and slim living room installation makes a stylish statement. We might be keen to pinch that lovely branch idea, too! So many extensions these days are simply attached to the back of an existing house with little or no regard for how dark they might be. A few perfunctory skylights can be added but it's rare to find a really usable amount of sunlight pouring into a new space. That's not the case here though. Clearly an artist will need access to a good light source and with that in mind, numerous amazing light panels have been created, thanks to large panes of walk-on glass in the roof. We think it makes the space so much less imposing and really helps to change how the wall colour looks in different sections of the build. Making great use of every nuance of available space, we think this loft bedroom is absolutely stunning and, yet again, has been decorated in line with the prevailing turquoise theme. Isn't it odd that it just never looks 'too much' and simply seems to belong? 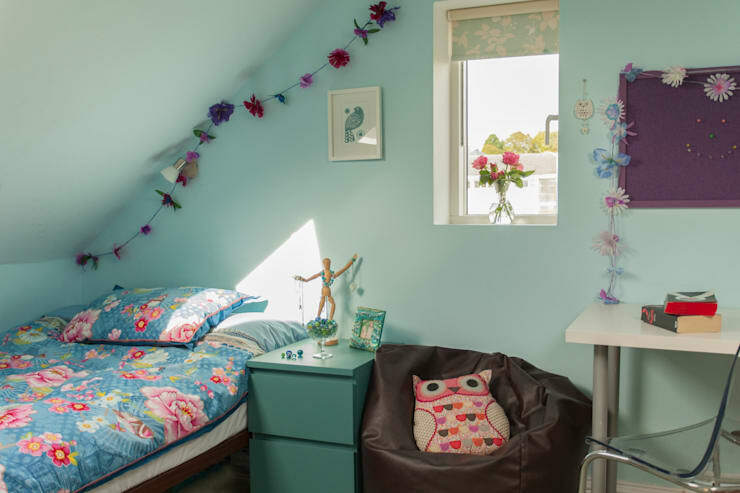 We love how this more feminine room still works well with the green but has introduced extra colours in the form of a vibrant bedspread and some fun flower garlands. It might not be the biggest of bedrooms but it certainly looks to be one of the cosiest and most beautiful. We love how this house has been so unapologetic in its embracing of one colour and think that it treads the line between stylish and eccentric to perfection. For more unusual home inspiration, take a look at this Ideabook: The Eccentric Brit. We love it when people push the boundaries! Could you embrace one colour to this extent? Are you shocked by how well the design works? Let us know your thoughts, below!